As always, a reminder to renew your membership by the last day of the current fiscal year (6/30). Renewing your membership online at www.swe.org is the easiest way! Or if you aren't a member, visit www.swe.org/join. Fill out an application online or print the Paper Application to mail in. If you have any questions regarding SWE, or need help joining, please feel free to email us at membership@swe-mn.org. 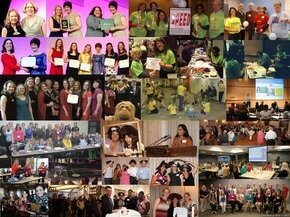 If you have any great ideas for future networking events in the Twin Cities, please email us at membership@swe-mn.org. We are always up for trying new events! Special events to welcome new members and recent graduates. Monthly lunches around the metro region, including Rochester. Annual winter party with cookie and ornament exchange. See our Corporate Sponsors webpage for a list of sponsors of SWE-MN. Visit the SWE National Corporate Sponsorship page for information on becoming a Corporate Sponsor. We know that SWE-MN members are accomplishing great things everyday, and we want to hear about those successful projects, new babies, engagements, weddings, promotions, new jobs. . . or any other great things that are going on in your lives. Please send member news to blog@swe-mn.org for publication in the SWE-MN blog and weekly e-mail.